My life as I know it truly began when I was 19. It was the year I left behind a sheltered and clueless existence in Malaysia to study in London. Before then I had never been anywhere without a driver or chaperone and never properly appreciated how relatively privileged I am. I had no inkling of life outside of Kuala Lumpur nor the world beyond Malaysia. I grew up thinking that fearing your government (when really they should be fearing their people), no freedom of speech in the press, and being arrested on sedition charges for publicly vocalising your disapproval of the current regime was the norm. My new friends in London laughed at me for being shocked by how English press could openly throw shade (for lack of a better term) at their MPs, mock the PM, print scathing headlines about parliament and not end up being locked in the Tower of London with the key thrown away. 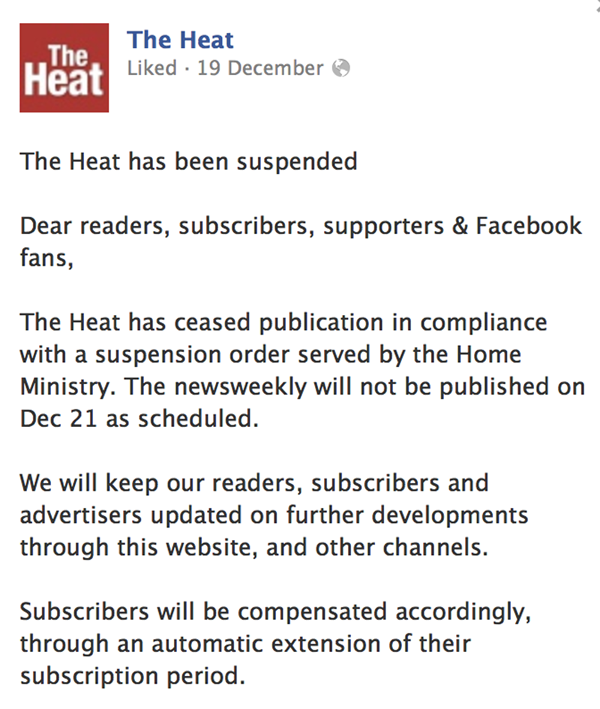 In turn they are surprised when I told them that the weekly newspaper that I produce my comic series Audaciously Yours for have been 'suspended indefinitely' by the Home Ministry for printing a front page story scrutinising our PM and his wife's spending. No, surprised isn't the word. Shocked, appalled, outraged, even grateful that they truly know the meaning of freedom of speech. Enter 'feeling the heat', 'put the heat on them', and other heat-related puns. When I found out on Thursday---the news broke on The Star online---I felt so many things at once that I couldn't even isolate a single emotion. I felt angry for reasons I don't even have to bother to explain. I felt sad that I wan't shocked, given that I grew up in Malaysia and know what to expect every time somebody 'toes the line'. I felt proud that The Heat are brave enough to publish incendiary and challenging articles that make our government sit up and pay attention. I felt fearful, because what will happen to Audaciously Yours? 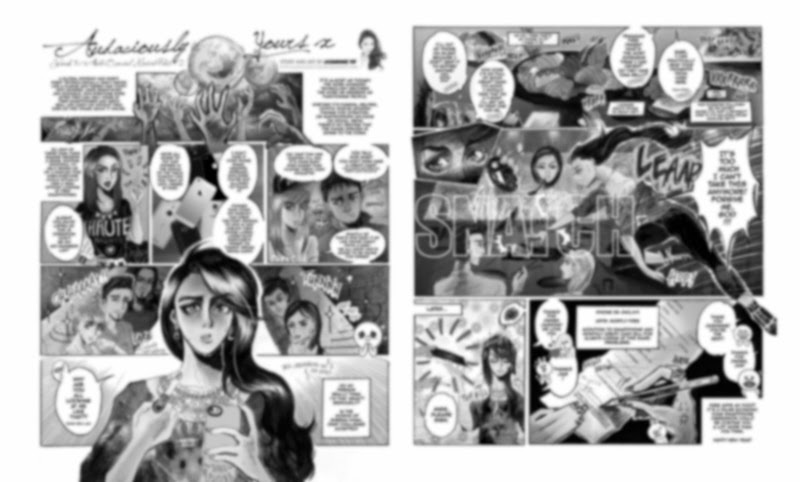 The Heat are the first and only mainstream publication in Malaysia to have the vision to recognise comics, sorry graphic short stories, as a medium. I felt ashamed and selfish for thinking 'What about me?' when I'm the least affected of the people who work for The Heat because I'm just a contributor. It's not my 9 to 5 job, not my bread and butter. I freaked out and called my mother who calmed me down. She sees this sort of thing happen all the time to The Sun (her company's newspaper) and explained to me about appeals, call-ups, overturning of decisions/rulings etc. I told Max and he just rolled his eyes (not that I could see from over the phone but I could practically hear and feel it) and rasped "Welcome to the world of journalism. I get death threats on a daily basis." So yes, nothing is set in stone. For now The Heat has been suspended. As for Audaciously Yours, PLEASE! I'm still drawing it. Not because I plan to publish it elsewhere. But out of good faith in The Heat because they had the vision to believe in me, hire me, and publish me. I'll sit on a stack of backdated articles for as long as I have to. Audaciously Yours will make a comeback. As will The Heat. Although I'm &@%^*! annoyed that this instalment of Audaciously Yours (Week 5) isn't going to print this weekend as originally intended. Especially because this is my best one yet. Whatever, others have bigger worries on their mind. I'm just a small fish in a big pond. 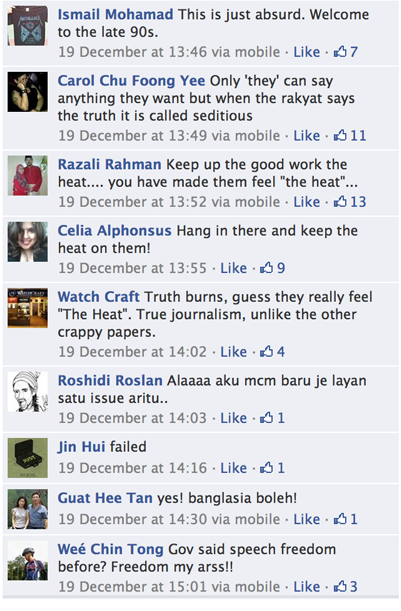 I had no idea Malaysia was that bad about free press/freedom of speech. I'm in shock. *huge hugs* can't wait to see all of the new installments when The Heat is back up and running! If I don't come back from Malaysia and you don't hear a peep from me, just assume that I've been arrested for this blog post. I can't even begin to explain how much your lovely, kind, thoughtful comment made me feel! Everything you said is all I've ever wanted to believe to be true about myself. I'm so touched. I feel a strange kind of warmth in my heart that could best be describe as hopeful? oh well, whats new from Malaysia! I still remember when Obama was in the running for President, the press released their (as married couple) earnings as its considered part of an important factor for people to make their decision in voting the next president. I was so impressed because I know transparency like this is expensive here in Malaysia hhmph. Thank you for not giving up on AY and hopefully we get to see The Heat in the newsstand soon! 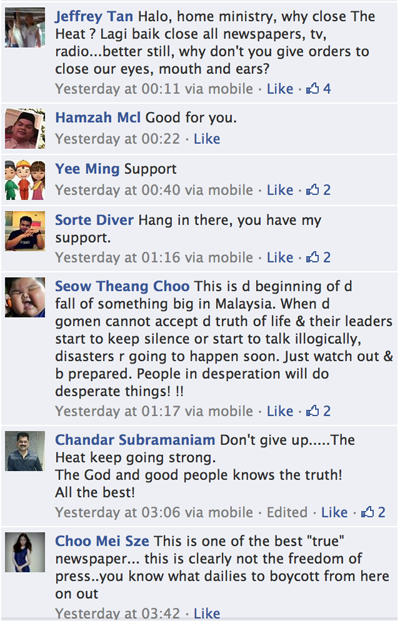 On the plus side, Malaysia has...um...few natural disasters, low cost of living, damn good (and cheap!) street food, and so many public holidays.